There are many churches out there today across our globe that continue to preach a message of religious exclusion for only the select few, which is a far cry from the one that Christ preached, that being a loving inclusion for all, which is precisely what the Netflix film, “Come Sunday”, is about. 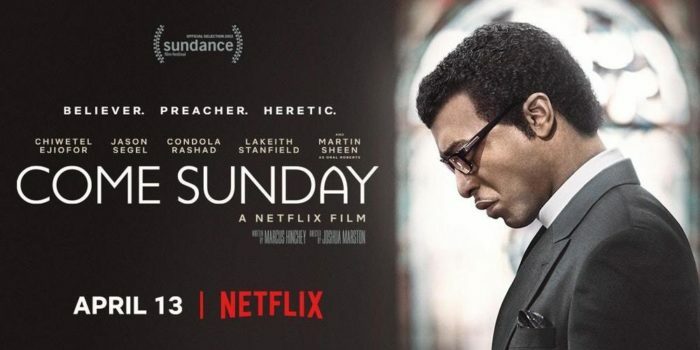 Starring Chiewetel Ejiofor, as Carlton Pearson, “Come Sunday” is a true story based upon this evangelist’s life as former Bishop of the now defunct Higher Dimensions Family Church, a church that once had more than 5,000 members. Pearson, a devout Christian raised with Pentecostal teachings, originally believed to his very core, that all non-Christians were doomed to an eternal damnation in Hell. He preached this very message from the pulpit week in and week out, quite successfully for many years. He was so successful in his ministry, he even served as spiritual advisor to President George H.W. Bush in the 90’s and frequently travelled across the globe on mission trips to help save as many souls as possible by bringing them to Christ. But, one day, while watching a TV program about the genocide in Rwanda, he felt God speak to him. In a moment filled with tears, the message he received was that God wasn’t going to punish all those people for all of eternity after their deaths, just because they hadn’t been saved. Rather, all of them were saved, and so was everyone else in the world as well, even if they never found Christ and turned their lives over to Him, which was exactly the opposite of the message he had been spreading throughout his entire ministry up to that point. As he began to spread this new message of inclusion, versus his former one of exclusion, preaching that God loved everyone and that every soul was saved no matter what, he began to lose the support of one follower after another, many suggesting he was becoming a tool for the Devil. Eventually, he became ostracized from the community by his fellow preachers and would go on to lose his church, his home, and his fortune. But, through the Spirit’s gentle nudging and the help of a few loyal followers that continued to believe in his new message of inclusion, Pearson would eventually land back on his feet to become the pastor at the All Souls Unitarian Church in Tulsa, Oklahoma. I was originally suggested by my friend Cedric to watch this movie, and I must admit that at first, I rolled my eyes when I quickly read its synopsis, thinking it was just going to be more of the usual Christian religious propaganda. I’m so glad I didn’t practice contempt prior to full investigation because I was very moved by the end of this film, especially because of how close it was to my own Christian experiences. I have been rejected by a total of four mega churches in my life thus far, all because I was gay. I was told by the pastor of each that I couldn’t be a “practicing homosexual” and a member of their church. I was always welcomed by each to stay and to hopefully practice celibacy instead, because then I wouldn’t be committing a sin in their scriptural beliefs. It was hurtful to receive this exclusion-based message over and over again, but it didn’t even end there, as in some circles of recovery from addiction and other social circles over the years, I was rejected by a number of other Christians, simply for being gay. And so, I had to find my own journey to a God that was beyond the one I had been brought up with, the one that would punish me if I didn’t turn my will over to Christ, confess my sexuality as a sin, and become something I wasn’t. On that painful road, I had my own coming to God moment, and it happened during a four-hour meditation late one evening back in 2003, where something took place within my very essence, that I can’t exactly explain that well to this day. What I can say is that it was the first time in my life I truly felt the presence of God and during it, I asked about my sexuality. The answer I received was that I was made this way and that all I needed to do was unconditionally love to the best of my ability whomever I chose to be with, man or woman, with all my heart, mind, and soul. From that point forward, my life with God took a drastically different turn, similar to what happened with Pearson after he watched that program on Rwanda and felt the presence of God come over him. I began to see things quite differently and couldn’t imagine a God anymore that sent Muslims, Jews, Hindus, Wiccans, Buddhists, Atheists, Agnostics, gays, lesbians, and anyone for that matter to eternal damnation, just because of who they were or the fact that they didn’t turn their lives over to Christ. I’ve known of too many good people, from many different walks of life, that have done wonderful things to help our planet be a brighter place, and the idea of God sending them to Hell, simply because of who they were or because they weren’t Christian, just didn’t feel right anymore within my Soul. Like Pearson, I now live today believing that everyone is saved. But, I also believe there is a hell that exists on this very planet right now, and it’s in the way people are treating each other. Far too many are more focused on their own selfish gains and interests these days, thinking of themselves first and everyone else second, and to me that is a living hell. It is one that is devoid of unconditional love and selflessness and if somehow there really is some type of hell beyond this plane as well, I think it would only consist of more of the same.